I just want you to know that I have been a good kid since I started playing Dark Warriors 11 days ago, and I deserve one of those eggs that everybody is talking about in Westland (it seems that everybody is sitting on an egg these days…). There is a grumpy yellow lady called Saint RedMoon that apparently doesn’t think the same, but I’m sure that once that you hear my story you will share my point of view. I couldn’t even count the number of cats that I rescued at the Forest, and how many old ladies I helped, searching for lost children, but I can tell you that they were a lot. I was trying to collect gold to buy a row boat and do some piracy at the Seafare, but every time that I reached the needed amount, an ox came and stole it all. I don’t know why would an ox want to have all that money… they eat grass, its not that he needs it to buy caviar!. I tried to go trapping to catch the ox and end with my problem, but all I got were squirrels and rabbits… so I guess its a slick one. There were other creatures stealing me and killing me every half hour, not just animals, but vegetables (Westland is a wild world…there are brave beans, mortal celeries, and dangerous onions…), so I decided to end with my miserably life and start again from zero. But it resulted that creating a new account wasn’t the best solution for me… The yellow old grumpy lady Saint RedMoon gave me a scold and deleted my new shinning character, so I went back to my old pants and to get mugged again. I decided to be funny and friendly with that lady, to cheer her up a little. 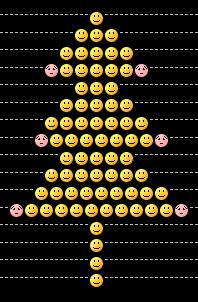 As I have the amazing ability to build a complete Christmas tree with emoticons at chat, I went there and worked a lot filling lines and lines with smileys. There was a player called Kinnison who apparently appreciated my art a lot, because he couldn’t stop laughing and celebrating what I was doing, giving me drinks of beer with pee (this people is really strange…). But the yellow lady doesn’t have a good eye for art… she yelled at me again, telling me not to flood the chat with smileys. When I tried to make it again, so she could see that I was just making a Chistmas tree, she got completely mad and banned me from chat. So now all I can do is to keep rescuing cats, hoping that you bring me a nice egg for Christmas, and also a Merchant Tricorne that could protect me from the ox and the rest of the dangerous creatures while I’m trying to help the old ladies to find their grandchildren. Ohh, and please, don’t forget to leave a present to the grumpy yellow lady… maybe you could make her smile. Merry Christmast for all of you!!! I wish you an enjoyable holiday close to the ones that you love, and a celebration plenty of peace, laughs and nice moments.